Click the button below to add the 700TVL High Res Wide Angle Bullet CMOS Camera - 4 Pack - White to your wish list. This new value pack is sure to impress not only your eyes, but your wallet. Kit includes 4 Cameras, 4 Cables & 1 Power Supply. With the technology continually changing, you are now able to get better cameras at an even better price. These 700TVL Zmodo Bullet cameras are one of the latest innovations to come out of the Zmodo Labs. The standard horizontal resolution (TVL) for most kits cameras on the market is 420 to 480 TVL. Typically cameras of this resolution would cost about double. Keep an eye on the people and places you care about most. This weatherproof camera with 700TV Lines delivers amazing video with a long operating life and reliable operation. This camera can capture video in darkness mode up to 65ft away with 24 built in IR LEDs. 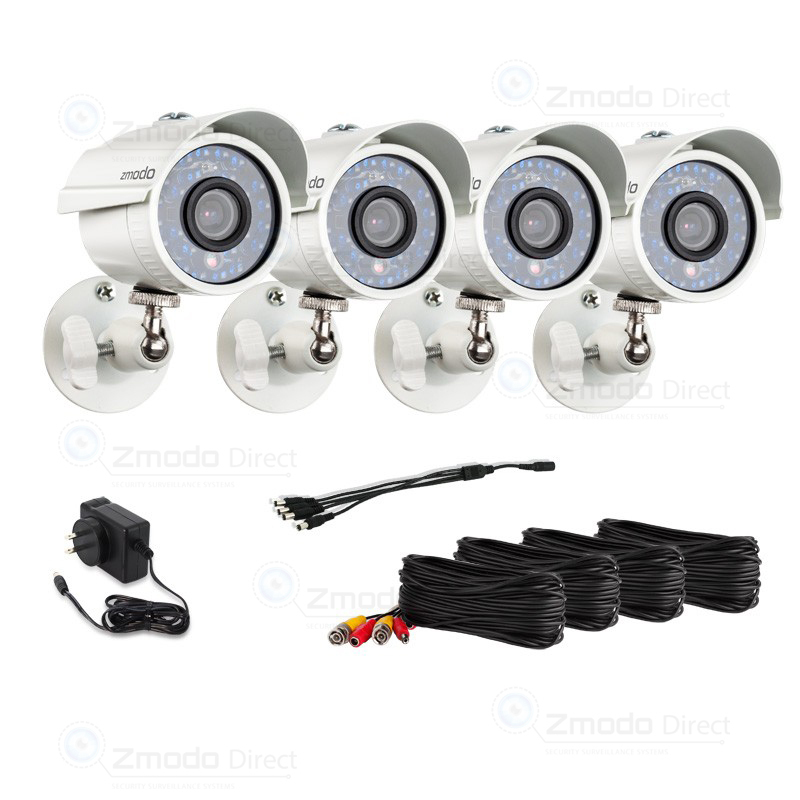 This Day Night Security Camera can be used both indoor and outdoor, and is easy to install. A male BNC connector is used for the power, and RCA jack is used to carry the 12V of power required. 3.6mm Lens - Wide Field of view - See a wider distance than a camera with a larger lens. Weatherproof - Mount these cameras outside without worring about whether or not they get wet. Standard Connections - Use these cameras on any number of DVR's that utilize a BNC & Power connection. Their compatible with most all DVRs. Easy to install - Save time with quick installation. 3 srews per camera, and a simple twist to connect the wires.